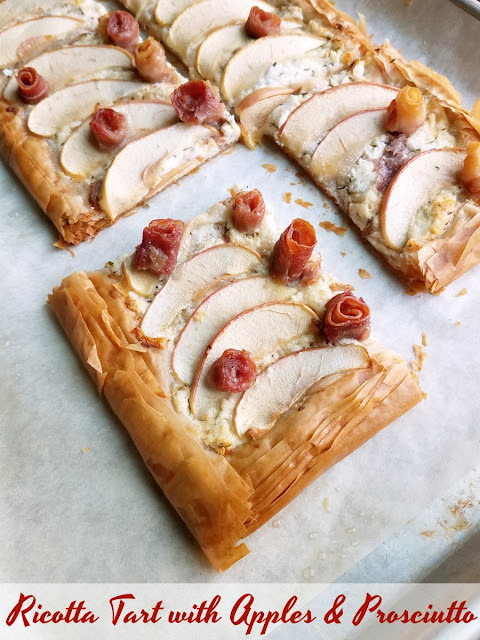 A savory tart with flaky phyllo crust, savory ricotta filling and a healthy dose of apples and prosciutto. It's a perfect fall appetizer or serve it for lunch with a salad. This recipe was made with products that were given to me from #AppleWeek sponsors The Spice House and Swiss Diamond. As always, all opinions are mine alone. This savory, cheesy tart has a lovely balance of flavors and textures. 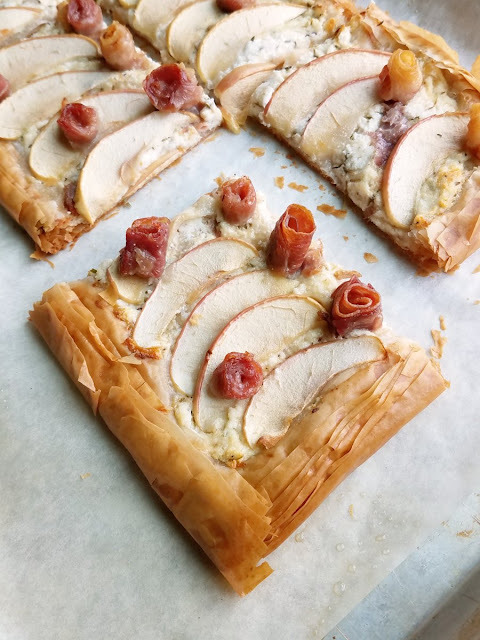 There's the crisp flaky phyllo crust, the creamy cheesy ricotta filling, and the sweet and savory apples and prosciutto. You can cut it into small squares for a fun appetizer or serve a larger portion with a salad for a perfect fall lunch. 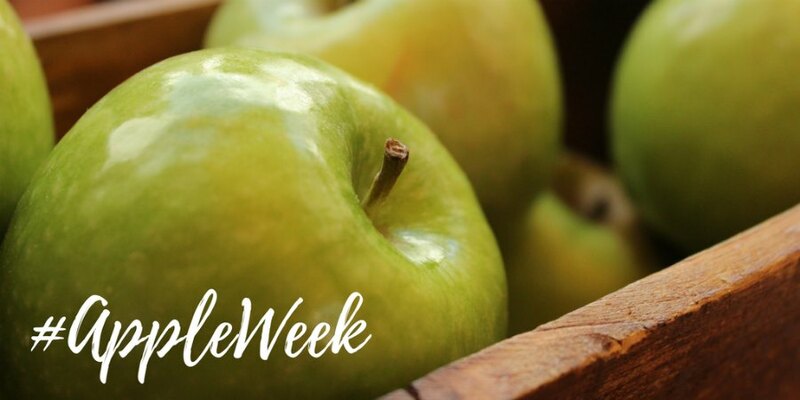 How has appleweek been treating you so far? I have been loving it! My to make list is bursting at the seams. I'm going to need a new notebook to keep track of it all. At least the appleweek pinterest board will help me keep it all together! Now I don't want you to fall over from shock, but this is my second savory recipe this week. The skillet chicken thighs with apples I shared Monday is going to be a staple at our house for a while. We all enjoyed it so much. As you can see from the pictures, we've already made this one multiple times as well. 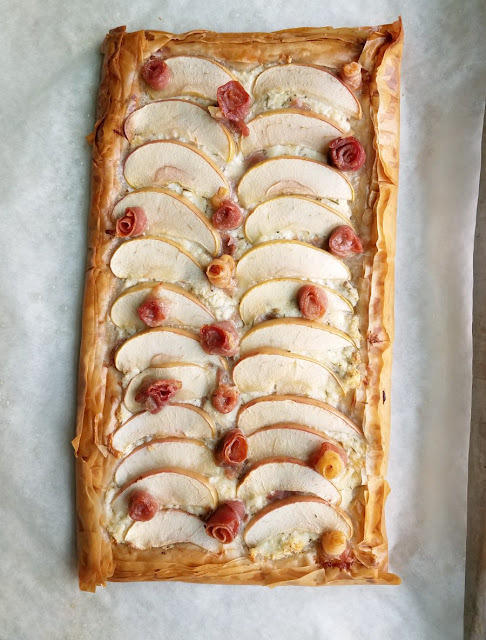 Once with prosciutto rosettes and once with it layered between the apples. It is also delicious. 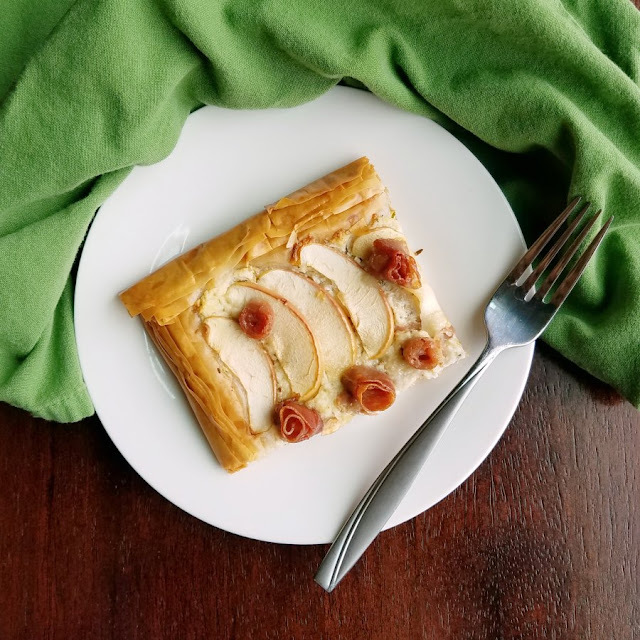 So tell your sweet tooth it needs to have a slice of ricotta tart and a chicken thigh with apples before you can have dessert! Anyway, today it's all about this tart. I had the basic idea of what I wanted rolling around in my head. Originally I thought I'd build it on a puff pastry base like I did my asparagus tart. Then phyllo popped into my head. I just love how it makes such distinctive flaky layers and it was the perfect base for the chanterelle tart I made a couple of years ago. So I broke out the phyllo and the pastry brush and went to work! 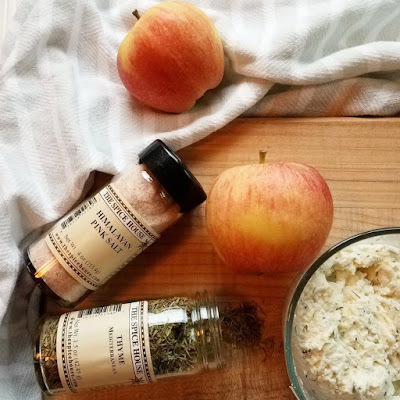 On top of the base, I spread a layer of ricotta and Parmesan seasoned with thyme, fresh cracked pepper and Himalayan sea salt from The Spice House. 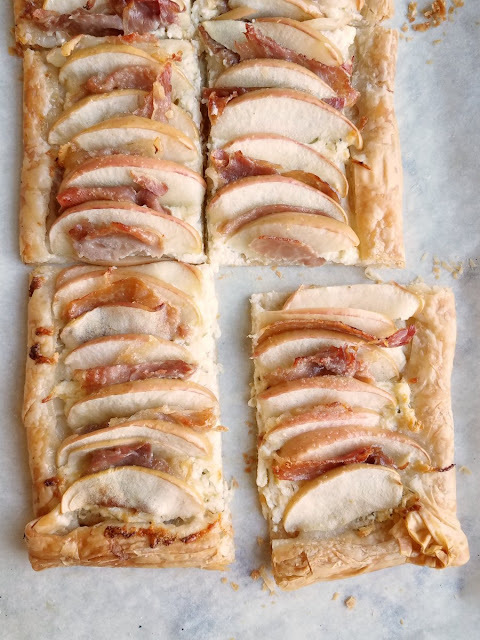 A layer of thin sliced apples and prosciutto topped that. 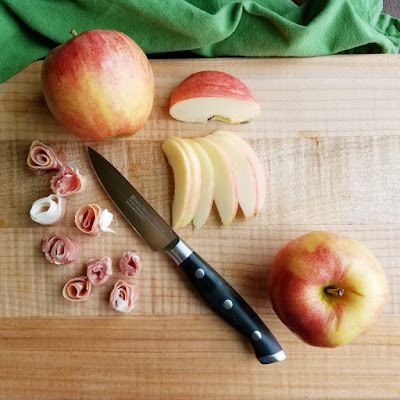 The secret to nice thin slices of apples is using a good (and sharp!) knife. My new Swiss Diamond paring knife worked wonders. When it comes to the prosciutto, I tried it two different ways. Once I made fun rosettes with some of the meat. I chopped the rest and sprinkled it under the apples. While I love the rosettes, it made cutting and evenly distributing the flavor more of a challenge. The next go I layered the prosciutto between the apples. That gave a more even flavor experience but it wasn't as much fun to look at. Really, you can't loose either way so do whichever calls to you. The apples looked a bit dried out on my forst attempt, though they tasted lovely. So tje second try, I brushed the tops with a bit of the oil left in the brush from the crust then sprinkled it with a bit more sea salt. Yum! Now it's time to add the ingredients to your grocery list so you can make your own! Place a sheet of phyllo dough on the prepared baking sheet and brush with oil or butter. Top with another sheet and brush with oil. Continue until all 10 sheets have been added. Fold over the outer 1/4" or so of dough to form a bit of a lit around the tart. Mix together the ricotta, Parmesan, thyme, rosemary, salt and pepper. Gently spread over the middle of the tart, avoiding the rolled edges. 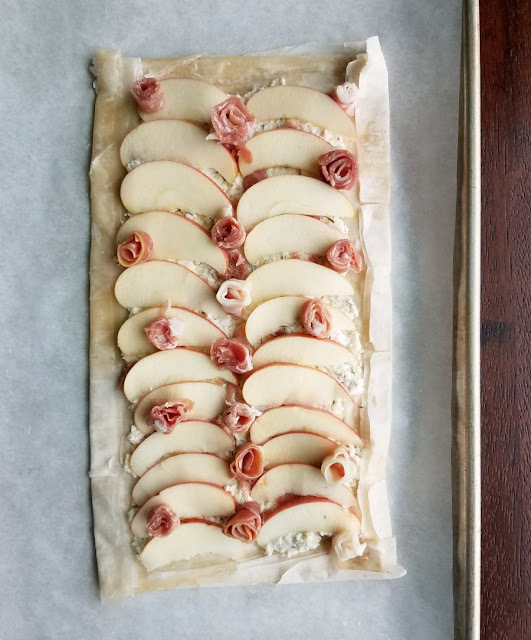 Arrange apple and proscuitto over the ricotta filling. Brush with a bit of oil or butter and sprinkle with a pinch of salt. Bake for 25-30 minutes or until phyllo is golden and crisp. I want to eat this on the porch and pretend like we're in a french cafe, YUM!! Happy Weekend doll! This looks delicious. I love the flavor combination and those little rosettes are a nice touch! That is completely gorgeous and sounds delicious. Oooh my! I'm make this for the next family get together! That is one gorgeous tart. Gorgeously stunning! Thanks for sharing on Friday Frenzy! You had me at Ricotta! and ten add in the apple with everything else?? keeper! It's a fun combination of flavors in a pretty package! Hi Carlee, this weekend I'm hosting a very small surprise birthday tea for Mum and a few of her friends. The cake I'm making is your recent German apple cake with cinnamon and cream cheese frosting (the perfect excuse) and now I may just have to make this too! They are a group of ladies who like their pastries. It looks like your tea was a hit! What did you end up making?